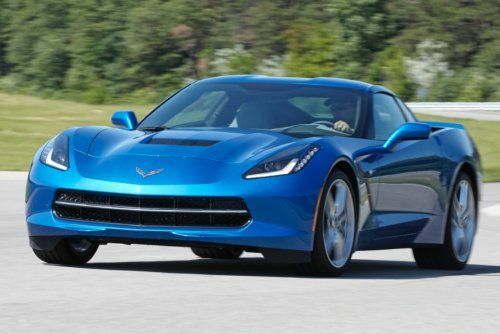 The 2014 Chevrolet Corvette Stingray Coupe fitted with the new 7-speed manual transmission and the 455 horsepower LT1 V8 is expected to offer around 17 miles per gallon around town and an impressive 29 miles per gallon on the highway. However, when the driver selects the C7 Corvette’s Eco driving mode, GM promises 30 miles per gallon on the highway thanks to the Eco mode’s Active Fuel Management – a system which shuts down half of the cylinders under light loads; like when cruising down the highway. When the driver selects the “Tour” mode, the Corvette still offers 28 miles per gallon but it is that 30mpg figure in Eco mode that makes the 2014 Stingray the most fuel friendly Corvette ever along with also being the most efficient sports car on today’s market. Now, before the naysayers begin to point out a handful of sports cars that get better than 30mpg, I should point out the wording that the 2014 Corvette Stingray is the “most efficient”…not the sports car with the best MPG ratings. General Motors points out that for vehicles with the available 455 horsepower of the new Corvette, all other sports cars fall short in fuel economy while those sports cars that offer at least 30 miles per gallon fall way, way short of 455 horsepower. The combination of power and fuel economy gives GM the right to boast that their new Corvette is, indeed, the most efficient sports car in the world. "The Corvette Stingray establishes the benchmark for modern performance cars by using technologies to deliver more performance and more miles per gallon," said Tadge Juechter, executive chief engineer for the Corvette. "We expect more and more performance cars will follow Corvette's example." General Motors goes on to highlight a few well known sports cars from around the world including the new Jaguar F-Type – a vehicle that could be one of the key opponents to the C7 Corvette for buyers in the market for a new 2-seat sports car. In the top of the line V8 S trim, the F-Type offers 495 horsepower but only 23 miles per gallon. Even the substantially less powerful base and S models with their supercharged V6 engines (offering 340 or 380hp) offer “only” 28 miles per gallon at best. Oh, the F-Type is also much more expensive than the Corvette with a price ranging from $69,000 to $92,000 compared to the Corvette’s base price of just $51,995 (click here for more on the 2014 Corvette pricing). Other close comparisons include the Porsche 911 Carrera S offers 400 horsepower and just 27 miles per gallon while the Audi R8 packs 510 horsepower and 19 miles per gallon. The 2013 SRT Viper also offers 19 miles per gallon on the highway with its 640 horsepower V10 while the 662 horsepower Shelby GT500 Mustang reaches just 24mpg (which is also pretty impressive). At the other end of the sports car spectrum, we have models like the Porsche Cayman, the BMW Z4 and the Scion FR-S which all offer comparable (if not better) fuel economy but far less power. The Cayman can reach 30 miles per gallon but it does so with a 275 horsepower engine. The BMW Z4 and Scion FR-S both offer an impressive mark of 34 miles per gallon but the BMW offers just 241 horsepower while the Scion packs just 200 horsepower. The base model Ford Mustang offers very similar fuel economy figures to the new Stingray with 19 around town and 29 on the highway (with a manual transmission) but it offers only 305 horsepower. In short, the 2014 Chevrolet Corvette Stingray Coupe will be hard pressed to beat when it comes to a combination of power and fuel economy. Of course, many high performance sports car buyers probably don’t worry too much about fuel economy but in the modern automotive world, offering great fuel economy AND tons of power could be the deciding factor for the budget minded buyer. Realistically, a buyer looking at the 662hp Shelby GT500, the 640hp SRT Viper or even the 510hp Audi R8 arent likely to say “Hey – the new base Corvette offers 30mpg so I will buy that instead”. However, those prospective buyers who are considering something like the Jaguar F-Type or the new Porsche 911 may lean towards the Corvette when they look at the performance numbers, the fuel economy capabilities and the considerably lower price of the new Stingray.